Now that the days are getting longer and there’s more time to enjoy the sun each day, it’s a great time to bust your camping gear out of storage and prepare for a springtime adventure to one (or more!) of the United States amazing national parks. As your tour guide and fellow traveler, we at StorQuest Self Storage are here to encourage you along the path to a more awesome life. That’s why we’ve put together our list of the top 10 national parks you must visit this spring. Check it out! Narrowing it down to just one Utah national park was tough. 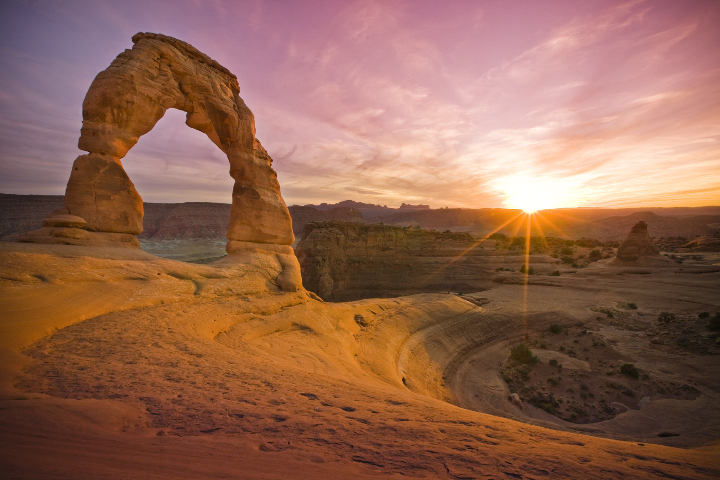 Along with Arches, you have Bryce Canyon and Zion, all of which could easily persuade you to pack up and move to Utah. But Arches is special, featuring more than 2,000 natural sandstone arches, the result of millions of years of erosion in a desert climate. As you explore the natural wonders at Arches National Park, you’ll also discover balancing rocks, fins, and pinnacles. You can find Arches four miles north of Moab, Utah, adjacent to the Colorado River. Biscayne National Park, located in Biscayne Bay at the north end of the Florida Keys, features four interrelated marine ecosystems: the mangrove forest, the Bay, the Keys, and coral reefs. A must visit, you’ll be able to view a wide array of animals including the American crocodile, various sea turtles, and the peregrine falcon. Go snorkeling, hiking, camping, sailing, and paddling at Biscayne National Park. Just remember, the park is 95% water, making most of it only accessible by boat – or parachute. Travel deep into the center of the earth at Carlsbad Caverns in New Mexico. This national park is home to 117 caves – the longest of which reaches over 120 miles! Not for the squeamish, over 400,000 Mexican free-tailed bats and sixteen other species call the caves home. Within the caverns, explore The Big Room. Spanning 4,000 feet, it’s the fifth largest chamber in North America and the 28th largest in the world. Pack your headlamp and prepare for an adventure that goes beyond the surface. Perhaps one of the most famously misnamed natural wonders, Crater Lake isn’t actually a crater at all. 7,700 years ago, an ancient volcano called Mount Mazama collapsed, creating a caldera which, over the seasons, filled with precipitation. Within that caldera now resides the deepest lake in the United States, Crater Lake. Incredibly clear with a vibrant blue hue, Crater Lake features two volcanic islands and no inlets or outlets. That means all of the water in Crater Lake comes in the form of precipitation, making it not only the deepest, but also one of the cleanest lakes you’ll ever see. And if you haven’t guessed, it’s super cold too. Visit Oregon’s Crater Lake National Park in the spring to view the Castle Crest Wildflower Garden which bursts with wildflowers this time of year – just don’t plan to spend the day swimming. Did we mention how cold it is? You don’t have to venture out of the contiguous United States to see glaciers. Glacier National Park brings visitors to Montana for 26 glaciers and 130 named lakes surrounded by Rocky Mountain peaks. Stay in one of the historic hotels in this region. Located on the U.S./Canada border, you’ll find a vast, pristine ecosystem that encompasses 16,000 square miles. Your inner paleontologist will swoon over Paleozoic fossils including trilobites, giant ferns, and dinosaurs. Bring the kids and your child-like sense of wonder for this incredible retreat through geologic time. Colorado probably isn’t your first thought when thinking of sand dunes, but it should be. Great Sand Dunes National Park and Preserve features the tallest sand dunes in North America – up to 750 feet tall! The dunes formed by deposits of the ancient Rio Grande River in the San Luis Valley. While you’re there, check out the 13,000-foot mountains, old-growth forest, and alpine lakes. Spring offers the best conditions for visiting the park as the sand gets very hot in the summer and there’s a lot of snow in the winter. So make the most of your visit to this adventure-lovers mecca by making your way soon, before the heat beats you to it. Head down south to Arkansas to visit the smallest, and only, urban national park. Hot Springs National Park is based around natural hot springs that flow out of the low-lying Ouachita Mountains. Bathhouse Row offers stunning examples of 19th-century architecture, making it the perfect place to relax and surround yourself in history. The water in the hot springs is believed to serve medicinal purposes and was the subject of Native American legend among several tribes. This easily accessible national park offers hiking, camping, and, of course, natural hot springs baths. It’s the perfect place to relax those weary traveler’s bones while taking in the rich culture and history of this unique national park. Olympic National Park is home to a wide array of ecosystems, from temperate rainforests to the alpine slopes of Mount Olympus and the shoreline of the Pacific Ocean, making it a photographers dream. Views from the Olympic Mountains include Hoh Rain Forest and Quinault Rain Forest, the wettest area in the contiguous United States. Go backpacking along the beach, hiking in the mountains, and take in the sights of the rainforest, all in one national park that’s anything but boring. The lush greenery of these ancient forests, mountains, and coastline will keep you on your toes – especially when you’ve almost got the perfect shot in frame. Who knew Washington was the home of such incredible beauty? Visit Saguaro National Park for a peek inside the great Sonoran Desert. The park features a variety of lifeforms spanning six biotic communities. Named for the giant saguaro cactus, the park also includes the barrel cacti, chollas, and prickly pears, as well as lesser long-nosed bats, javelinas, and spotted owls. Choose to explore one, or both, of the two districts, the Tucson Mountain District to the west and the Rincon Mountain District to the east. Visit this Arizonian park for equestrian riding and springtime hiking before the heat of the summer, since the heat does get a little prickly. Sequoia and Kings Canyon National Park boasts some of the world’s tallest trees. It protects the Giant Forest, which includes the General Sherman, the largest measured tree in the park. In addition to stunning, giant sequoia trees, visitors can also visit over 240 caves, hike through the Sierra Nevada mountain range, and explore Moro Rock, a large granite dome. Although the iconic “tunnel tree” toppled in a winter storm this past January, there are still a number of sights to see, as well as great camping, hiking, fishing, and backpacking. It’s like a one-stop-shop for all your adventuring in California! Want to See and Do More? Volunteer with NPS. With 59 national parks spread out over 29 states, there is no shortage of natural areas to explore. From Alaska to the US Virgin Islands, the National Park Service is hard at work maintaining these beautiful spaces. If you would like to learn about how you can give back and get involved, visit the National Park Service website. And when you’re ready to pack up and get going, remember: StorQuest Self Storage has your back for all of your adventuring needs.